If you run a membership site and are also looking to sell products to your private audience, then setting up a WooCommerce members-only store is the way to go. This enables you to sell products exclusively to your members as well as have multiple membership plans, each with access to different products. Whether we’re talking about a private community, closed online course or niche club, a members-only store will help you focus on different groups of customers (based on their subscription), and offer tailor products to a specific group (besides the premium content). In order to add a WooCommerce members-only store to your membership site, we’re going to use two plugins that are beautifully integrated, namely WooCommerce and Paid Member Subscriptions. Paid Member Subscriptions is an intuitive membership plugin that can be set up in under 3 minutes and 4 easy steps, by using shortcodes for Member Registration, Content Restriction, and Subscription Plans. You can check this documentation regarding the installation and activation of both plugins. Paid Member Subscriptions allows you to restrict product view and product purchase based on logged in status, as well as subscription plan. This comes in handy when you need to filter which of your members get to see and purchase specific WooCommerce products. Let’s go ahead and create several subscription plans: Free, Basic, Gold, Premium and Lifetime. After creating and activating the subscription plans, we will add some products in WooCommerce Products section. In my case, I have chosen two type of products: books and audible files. Now, we’ll take a closer look at the content restriction within a product. Let’s take the audible file for example and divide the product restriction into two parts. In this Meta Box, you can select which subscription plans get to see this specific product. It’s an easy way to hide product from logged-out users or non-members. 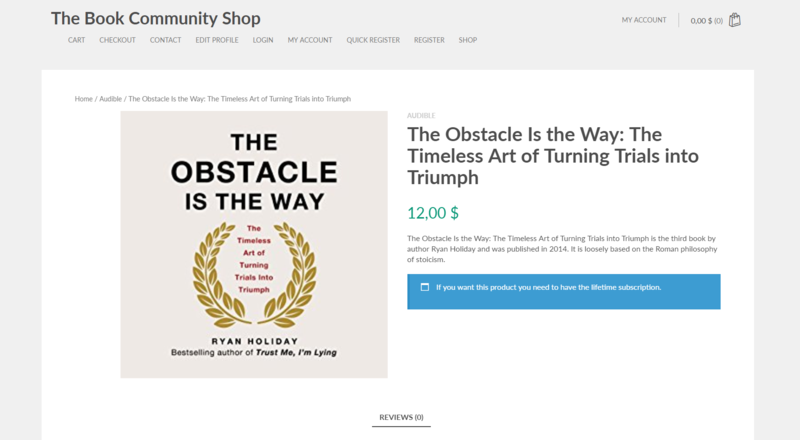 In my example, we’ll make it so every subscription plan will be able to see the audible “The Obstacle Is the Way: The Timeless Art of Turning Trials into Triumph”. This is a second product restriction phase, allowing you to restrict which subscribers can actually purchase this product. 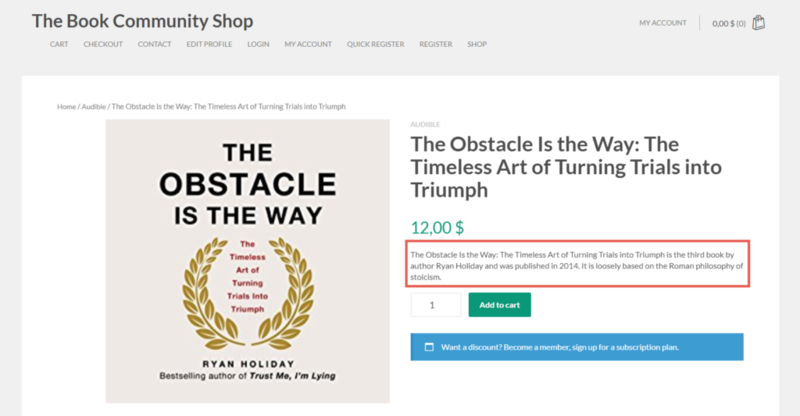 Taking into consideration the same Ryan Holiday audible file, we’ll make it so only Premium and Lifetime subscribers can purchase it. If the user is subscribed to a different membership package (Gold, Basic or Free), a purchase restriction message will be displayed. Now, it’s time to talk about how you can customize restriction messages per product. You already have some default ones, which can be found under Paid Member Subscriptions – Settings – Content Restriction, and you can customize them even more. Going back to the editing interface of Products in your WordPress Dashboard, you will find a section (below the Display and Purchase Options) showing a checkbox and options for Custom Restriction Messages. Here, you have the first box, where you can set up a custom message for logged-out users. And further you also have two more boxes to customize your tailored message for non-member users, which means that they are already registered to your site, but didn’t subscribe to any membership packages. You can also set a custom message for restricted product purchase, which will be displayed only in the following case: when you have a user subscribed to a premium membership package and who wants to buy books available for the Gold users only. If you remember, everyone can see the products from your shop, but they are restricted based on the membership plans. This little Meta Box enables you the possibility to display a custom description about your product. In our case, we talked about books and I am pretty sure every one of you have read the description of a book when shopping online. So, I think it’s important to display the most important information about your product. The integration between Paid Member Subscriptions and WooCommerce also allows you to offer special product prices based on the membership package a user has subscribed to. 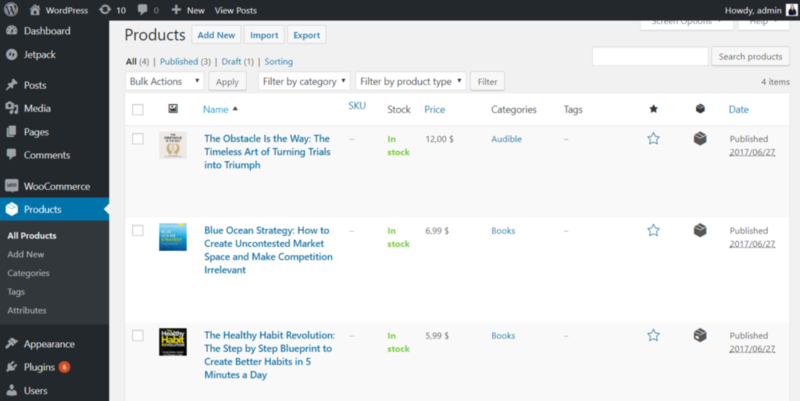 Further, you can also set some special discounts, if you are editing a particular product in the Products Section – WordPress Dashboard. There you will have another Meta Box that will enable you the possibility to set the discounts behavior. Now, to sum up the things explained above, I will show you how members will see the shop if they are logged in. Let’s say I wanted to offer a membership discount for my premium users for certain books and audible files. A short message saying “Member discount!” will be displayed above the product. This badge is also visible on the individual product page. The product price will also change accordingly, taking into consideration the existing membership discounts. This way premium members will be able to purchase the product at a special price. That’s it. You took all the required steps for adding a WooCommerce members-only store to your membership site. Well done! We went through creating subscription plans, adding products to our store, restricting product view and purchase for non-members as well as creating membership discounts for our select group of users. We used custom restriction messages as a call to action for becoming a member or upgrading your subscription. Are there any other features you’re looking for before to make your WooCommerce members-only store even better? Share your thoughts in the comments section below. Exactly what I was looking for. I have been trying many different plugins available in wordpress plugin directory but this one is the best of all I have tried. Great job!